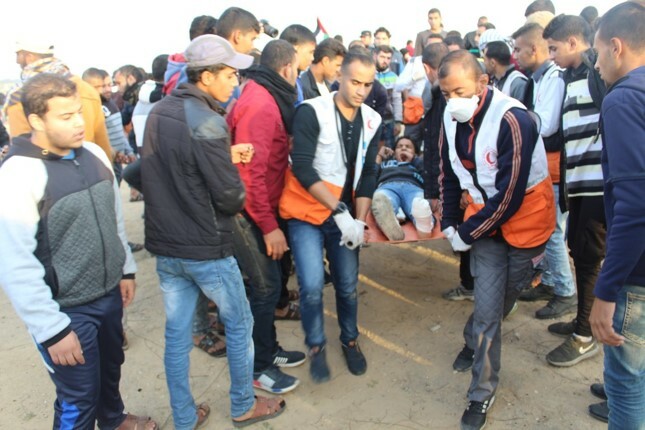 On Friday afternoon, 16 November 2018, Israeli forces wounded 54 Palestinian civilians, including 11 children, 1 woman and 4 paramedics in the peaceful demonstrations in the eastern Gaza Strip despite the decreasing intensity of the demonstrations there for the third week consecutively and absence of most means usually used during the demonstrations since the beginning of the Return and Breaking the Siege March 7 months ago. According to observations by PCHR’s fieldworkers, for the third week since the beginning of the Return March on 30 March 2018, the demonstrators abstained from setting fire to tires while the attempts to cross the border fence and throw stones and incendiary balloons were completely absent. Moreover, throwing stones and Molotov cocktails decreased and in Khan Younis the demonstrators did not cross what is known as “Jakar” Street while in other areas crossed only few meters. It should be noted that the demonstrations were preceded by Israeli forces’ wide threats as Kamil Abu Rukun, the Coordinator of Government Activities in the Territories (COGAT), published a video in which he threatened to use force against the demonstrators and anyone who approaches within 100 meters of the fence, tries to cross it, or throws indelicacy balloons and will put himself at risk. The same threats were also repeated by the Spokesperson of the Israeli Forces, Avichay Adraee. At approximately 14:30, thousands of civilians, including women, children and entire families, started swarming to the five encampments established by the Supreme National Authority of Great March of Return and Breaking the Siege adjacent to the border fence with Israel in eastern Gaza Strip cities and raised flags, chanted national songs in addition to organizing sportive and folklore performances inside the encampments and its yards. Hundreds, including children and women, approached the border fence with Israel in front of each encampment and gathered tens of meters away from the main border fence. Further, setting fire to tires, throwing stones, incendiary balloons and Molotov cocktails were almost absent. In general, the demonstrators gathered in places open to the Israeli snipers, who were stationed on the top of the sand berms, military watchtowers and in or behind the jeeps. Despite the prevailing calmness, the Israeli forces fired live and rubber bullets in addition to hundreds of teargas canisters, particualry in eastern Jabalia, Gaza and al-Bureij refugee camp. 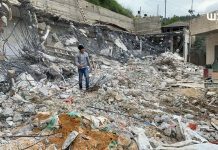 The Israeli shooting, which continued at around 17:30, resulted in the injury of 54 Palestinian civilians, including 11 children, 1 woman and 4 paramedics a. In addition, hundreds suffered tear gas inhalation and seizures due to tear gas canisters that were fired by the Israeli forces from the military jeeps and riffles in the eastern Gaza strip. PCHR hereby emphasizes that Palestinians’ right to peaceful assembly guaranteed by all international human rights instruments and stresses that the Israeli forces should stop the use of excessive force and respond to the legitimate right of the demonstrators, particularly with regard to ending the closure which is the genuine solution for ending a humanitarian catastrophe in the Gaza Strip.